With dental implants in Wichita, KS, we can restore missing teeth with a fully-functional and natural-looking prosthetic tooth or multiple teeth. Unlike a bridge or denture, implants are a fantastic solution for missing teeth since they are surgically implanted into the jawbone in the spot your natural tooth would be. Many people do not know that dental implants can replace a single tooth, multiple teeth and even the whole upper and bottom set of teeth (especially for patients who wear dentures). What are the results of getting dental implants? We recently had a patient ask if we could please share with her husband some of the photos we had taken. Why? She saw what she looked like now and she was so happy that her smile was huge! She wanted her husband to have the pictures because it had been a long time since she had smiled in pictures. We found out she had been ashamed of her smile. Not anymore! Another patient was devastated after losing a front tooth in the center of their smile. Tired of wearing an appliance that had to be removed every time they ate in public, they came to us for a dental implant solution. It makes us so proud that we were able to give back their tooth, their smile, and their dignity! What else may be involved in the dental implants journey? 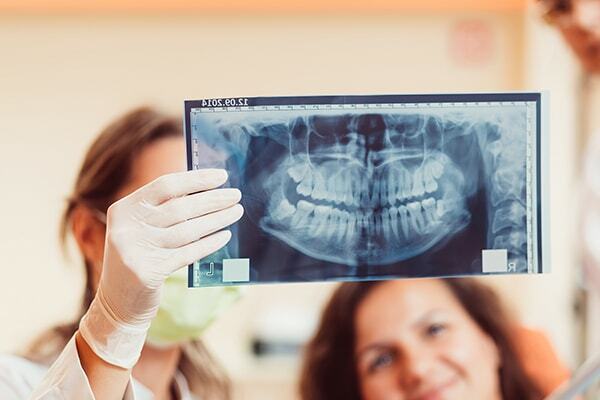 Our dentists at Smile Connections can help regenerate and heal damaged bone and gum tissue and remake a natural-looking tooth for your smile. The goal of this process is to restore your smile’s health and beauty again—with your comfort and trust being our utmost priority. There are many other comprehensive dentistry solutions available for your smile to be in optimal shape for a lifetime. We even recommend wearing an occlusal guard to help protect your investment in your smile from tooth-grinding at night. What can you expect at Smile Connections? At Smile Connections, we replace old-school methods with new advanced techniques to restore your smile and dignity. Our mantra is to go the extra mile to take great care of you while we work with the surgical specialist. Together, we create a tooth (or set of teeth) that is fully-functional and matches perfectly with your natural smile’s appearance. We actively guide you through the dental implant process from start to finish so you never have to guess what is coming next. To make everything easy and painless for our dental implant patients, our office has many options for financial arrangements and will work with you to find the best option. We will also assist with appointment scheduling and communication every step of the way with the surgical specialist who will place the implant post. The new tooth that looks and functions like a normal tooth. This may also be a set of prosthetic natural-looking teeth. 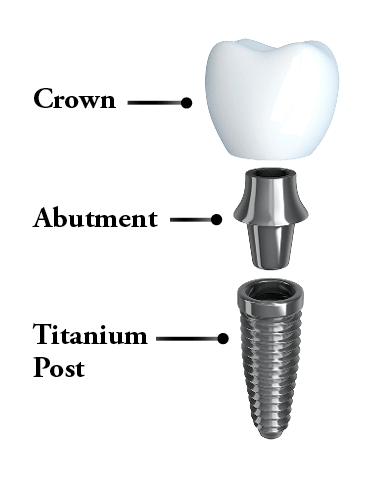 The abutment is like a surgical-grade screw that joins the new tooth and the post. The post which fuses with the jawbone and functions as the root or anchor of the new tooth or prosthetic. At Smile Connections Family Dental, our pampering team of dental experts can restore the aesthetic and function of your smile.